I am subscribed to the latest updates from the official Google blog, and to be honest, as much as I try to be enthusiastic about what Google does, often I find it a little over my head or just a bit boring. But not today. The email that came through today mentioned the quake in Japan. This has been on the news a lot. We have also seen 2 things on Google that have not been done before, the tsunami alerts on the homepages (which I blogged) and also the service to help people locate missing friends and relatives. Today the Google update I received told the story of the Googler (Google employee, hopefully Google employee of the month) that was sitting on the 26th floor of Google’s Roppongi Hills office in Japan when the 8.9 magnitude earthquake struck off the Japanese coast. OK, just looked into this a little more. The Roppongi offices are inside the massive 56 story Mori Tower which forms part of the Artelligent City in the Minato district of Tokyo. Also inside the tower are many other large multinational companies, such as The Pokémon Company Barclays Capital, Ferrari Japan, Goldman Sachs, TV Asahi, Time Inc., Chevron, Lenovo, Baidu, BP, SAS Institute and Google. I wonder if the Baidu and Google guys even lunch together….. OK, back to the story. Like most office workers his first thought was to look out the window and stand in shocked awe for a moment whilst the normally tranquil skyline swayed to the beat of a gadzillion megatonnes of continental plate slipping under the sea. What made this Googler different from the average office worker, was that rather than stand and make a decision to wait in a quake proof office or head to the emergency exit, he heading back to his desk. Now, you may recall the tragic stories of people that heading back to their desks back in September 2001 when the twin towers of New York were attacked. They did not escape in time. Heading back to your desk is sometimes the worse thing you could do, in terms of self preservation at least. So why did this Googler go back? Firstly, who was he? His name was Ken Miura. He is Japanese (I assume), and has experienced earthquakes before. In fact he experienced the Kobe quake of 1995 that devastated the Great Hanshin area. Many lost their lives in Kobe. Mind you, that was really just a little quake, only measuring a tiny 6.8 magnitude. “I couldn’t help but stay and search for information about the earthquake’s epicenter and scale. 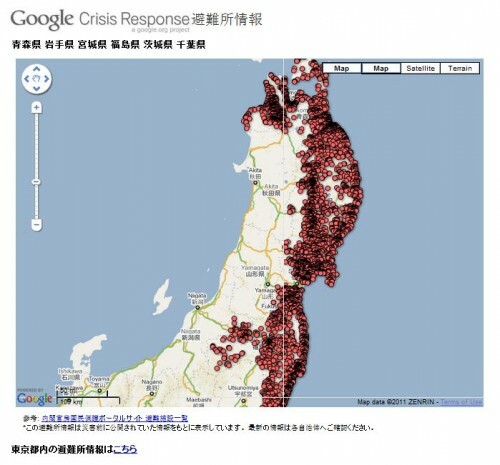 Amidst a series of aftershocks rocking our office, a small group of us in Tokyo and several other Google offices started gathering information about the earthquake to create the Crisis Response information page. When I read this my first thought was, I wonder if he studied geography like I did? When events like this happen my first thoughts are always “where is it?” followed by “who lives there?”. But I guess it does not take an education in geography to think like that. The work this team did pushed information to the top of the Google search index as well as create a vital resource for rescuers and people looking for answers. I seems that the results of the work were intergrated into the already existing site in Google (or part of Google) that was set up in response to the Haiti earthquake in January 2010 and used again for the Chile earthquake, the Yushu earthquake, and the Pakistan floods. This is a page set up specifically to help people find each other. A choice of 2 simple boxes “I’m looking for someone” and “I have information about someone”. So, Googler of the month, Ken, a hero of IT, a selfless guy who puts the wellbeing of others before himself. A true hero. Knowing that there are people like this in Google makes you feel confident that the people have chosen Google to be the company that organises, stores and shares the World’s data.